This weekend the legend Art Cashin, director of stock market floor operations for UBS, spoke with Eric King. Art discussed his memories of the 1987 stock market crash and how it relates to the markets today. For those that do not remember, in the 1987 crash the stock market dropped over 508 points in a single day, which was a 22% drop at the time. The equivalent would be for the stock market to drop by 2200 points on Monday. I've read so much about numbers 1 and 3 that I feel like I was there. The last two I was fortunate enough to live through as a market participant. But I digress. The important part of the discussion was how easily the markets could replicate the 1987 crash today. Art commented that the markets currently trade in such a uniform manner (dollar down and everything else up, and vice versa) that there is a tremendous danger should there be a event causing a rush toward dollars. 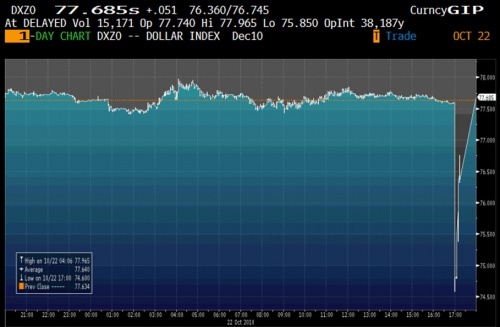 A flash crash, if you will. Many participants feel that this could never occur in the currency markets because of the sheer size of the market. That was until this past Friday afternoon after the markets closed. The DXY, which is the index that tracks the dollar against a basket of currencies, experienced a flash crash. If this occurred during the actual trading hours when the high frequency trading computers were still turned on, it would have triggered mass chaos in the market. This is the exact same situation that Art Cashin discussed before this event occurred on Friday evening. I believe this event is coming again, only it will be in much larger fashion. This means that investors need to have "dry powder" available at all times to take advantage of a market dislocation. Gold, Silver, Oil, Agriculture, Canadian dollar, Australian dollar, Asian and Brazilian currencies. If any of those look attractive to you, (and they should) make sure you have dry powder available.